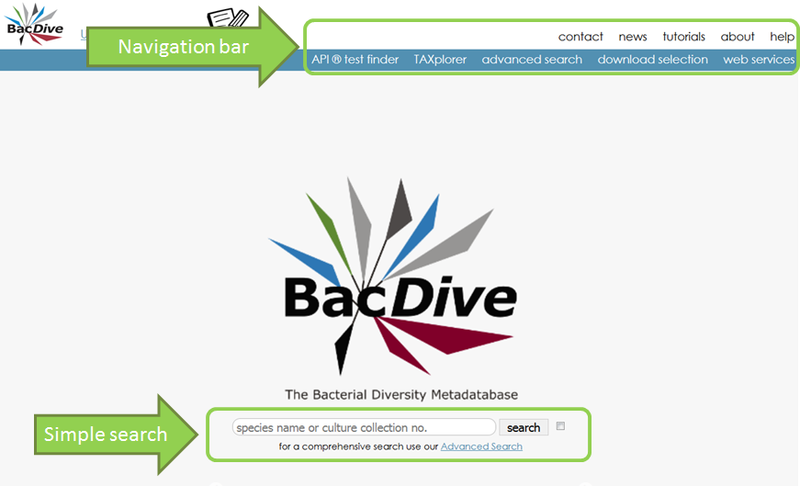 BacDive represents a collection of organism-linked information covering the multifarious aspects of bacterial and archaeal biodiversity. The content encloses information on taxonomy, morphology, physiology, sampling and environmental conditions as well as molecular biology. For a quick access to strain related information within BacDive use the simple search at the portal entrance. Alternatively the TAXplorer can be used to select a strain by browsing through taxonomy. More sophisticated queries can be performed by the use of the advanced search available in the navigation bar. Search results are listed as a list and by clicking on a list entry you call the strain detail view. Via the navigation bar you can also reach the download selection, the FAQ, our news and our imprint and contact information.